Separate plasma samples are collected for metabolite analysis during the PET study. A small volume of each plasma sample is applicated onto TLC disk or injected into the HPLC column. 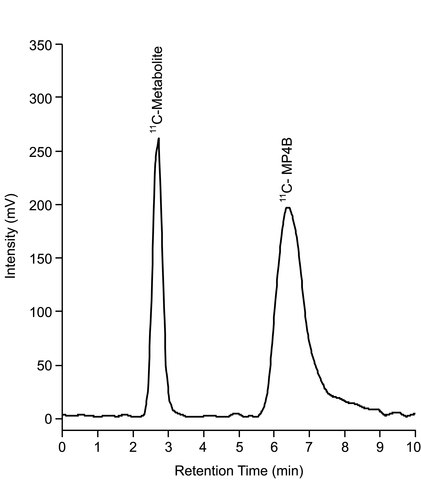 From the resulting chromatograms, the relative fractions of unchanged tracer and labelled metabolite(s) are calculated. 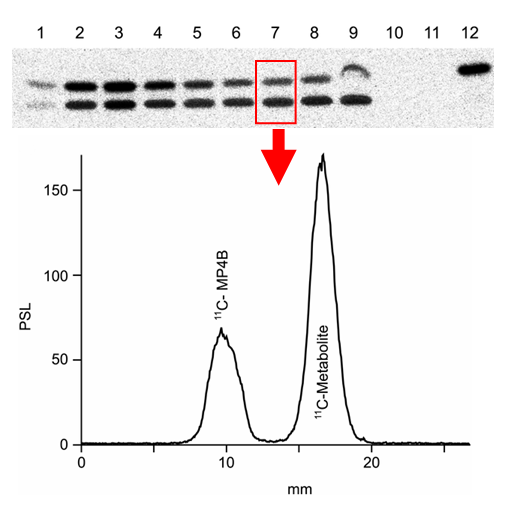 Fig 1.Thin layer chromatography. © Anne Roivainen. Fig 2. HPLC chromatogram. © Anne Roivainen. Greuter HNJM, van Ophemert PLB, Luurtsema G, Franssen EJF, Boellaard R, Lammertsma AA. Validation of a multiwell γ-counter for measuring high-pressure liquid chromatography metabolite profiles. J Nucl Med Technol. 2004; 32: 28-32. Greuter HNJM Greuter, van Ophemert PLB, Luurtsema G, van Berckel BNM, Franssen EJF, Widhorst BD, Lammertsma AA. Optimizing an online SPE-HPLC method for analysis of (R)-[11C]1-(2-chlorophenyl)-N-methyl-N-(1-methylpropyl)-3-isoquinolinecarboxamide [(R)-[11C]PK11195] and its metabolites in humans. Nucl Med Biol. 2005; 32: 307-312. Hilton J, Yokoi F, Dannals RF, Ravert HT, Szabo Z, Wong DF. Column-switching HPLC for the analysis of plasma in PET imaging studies. Nucl Med Biol. 2000; 27: 627-630. Nics L, Hahn A, Zeilinger M, Vraka C, Ungersboeck J, Haeusler D, Hartmann S, Wagner K-H, Lanzenberger R, Wadsak W, Mitterhauser M. Quantification of the radio-metabolites of the serotonin-1A receptor radioligand [carbonyl-11C]WAY-100635 in human plasma: An HPLC-assay which enables measurement of two patients in parallel. Appl Radiat Isot. 2012; 70(12): 2730-2736. Passchier J. Fast high performance liquid chromatography in PET quality control and metabolite analysis. Q J Nucl Med Mol Imaging 2009; 53(4): 411-416.